An addictive taste ! Our new delivery of Chocolate. Customers often confess, in a rueful tone and blissful smile that they are addicted to chocolate ! Not so I tell them, not the case with chocolate, even an choco addict does not need to increase his or her intake to experience the same degree of pleasure and can be deprived of it altogether without withdrawal. 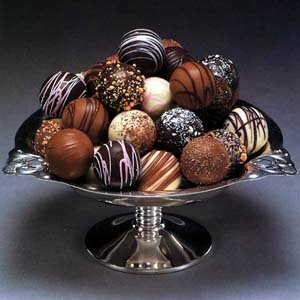 Chocolate makes you feel better, the magnesium eases stress, sugar soothes anxiety, caffeine and theobramine stimulates mind and body. Unfailingly chocolate produces a mild euphoria and feeling of well being encouraging the secretion of endorphins, a form of morphine produced by the body. Tortured souls could do much worse than resort to chocolate, why not feel the need for a gentle lift and unashamedly enjoy the good things in life ! Belgian Chocolates straight from our Chiller.